This is Cairo oldest working mosque. People still come to pray here everyday. 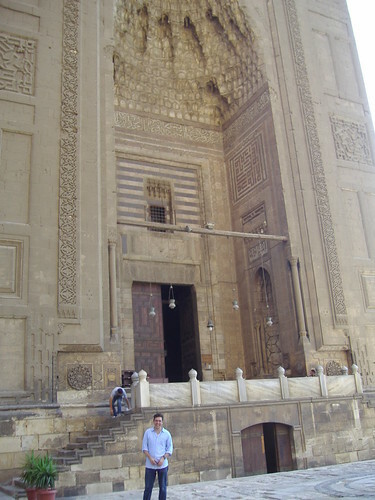 Built by Ibn Tulun, who was sent to Cairo by the Abbasid caliph. It was built around 876 AD. It’s really stunning, almost entirely open to the elements with a place to wash before prayers in the center of the praying area. Here’s K by the washing area. Like everything in old Cairo, you gotta pay extra to get to the good bit, which is the minaret. Over a thousand years old, and they still let you climb it. Here’s a view. 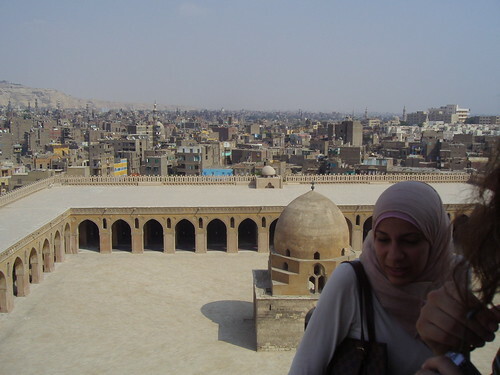 Old Cairo is a strange place, it reminded me in some ways of the walled portion of Jerusalem. Except with cars, and less machine guns. It’s still in constant use, with people living and working there who have nothing to do with the tourism industry. There’s also an odd tension between restoration and use going on. Some of the less famous mosques, almost as old as Inb Tulun, are falling apart. We went into one that had a giant hole in the wall. There’s just not enough money to keep it all going, especially when it is being used so much. Also, some of which is restored looks a little… fake as well. As K said, sometimes the restorers get a little overzealous. I didn’t get any good pictures of this, but I’ll try on my next trip. Hassan was a Mamluk, the slaves who turned into the rulers of Egypt in the mid 14th century. 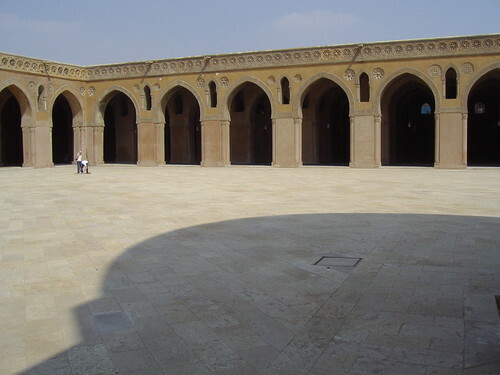 The complex inside is huge, with a giant minaret, a hospital, and a crypt room where Hassan was to be buried. Unfortunately, he got assassinated, and his body was never discovered, so the guy isn’t actually buried in there. 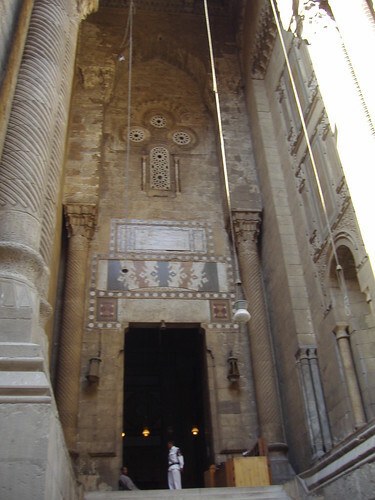 Next to the Hassan Mosque is the Mosque of A Rifai, where King Faoruk, and members of his family are buried. 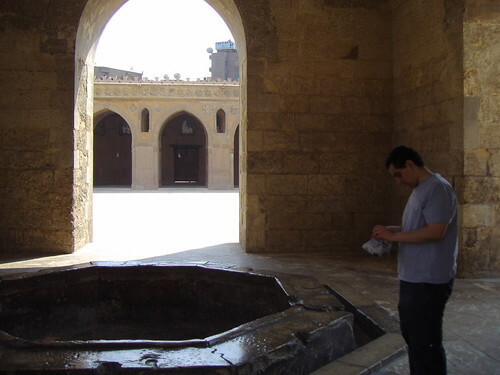 It’s a much more recent than the Hassan Mosque, dating from the early twentieth century* Five pounds and the soldier guarding the tomb gave me my very own call to prayer. Not that I asked for it, but whatever. 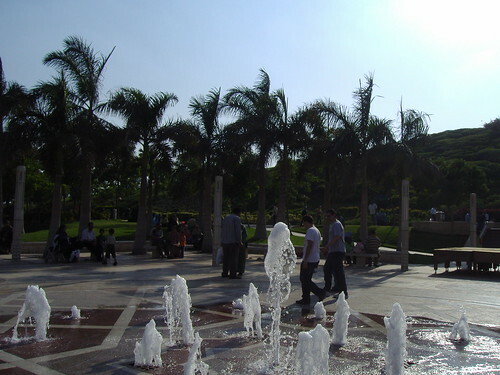 After this we went to Al Ashar park for dinner, which is literally built on an old garbage dump. It’s nice, I guess. If you like L.A. When I think about Dubai, this is what I think it looks like. *That’s historic Cairo, I guess, a hundred years old is no big deal.